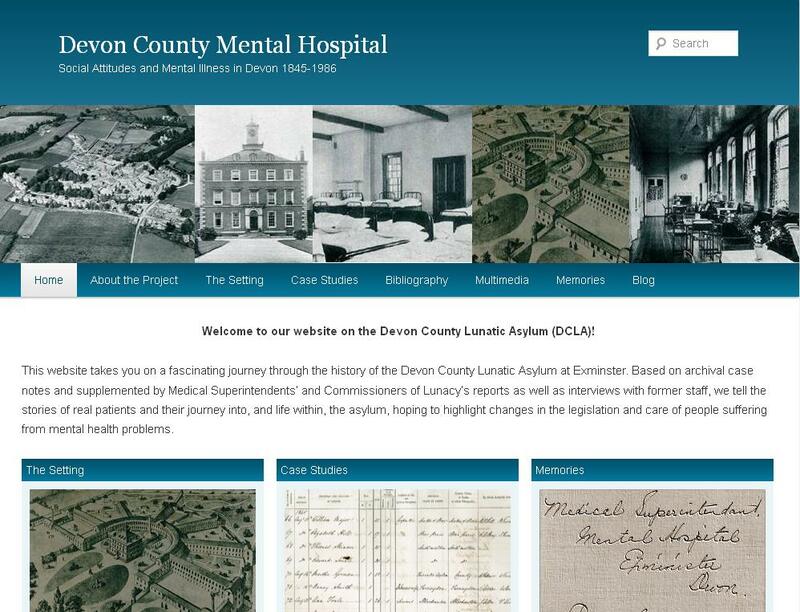 The Devon Country Mental Hospital website takes you on a fascinating journey through the history of the Devon County Lunatic Asylum at Exminster. Based on archival case notes and supplemented by Medical Superintendents’ and Commissioners of Lunacy’s reports as well as interviews with former staff, the website tells the stories of real patients and their journey into, and life within, the asylum, hoping to highlight changes in the legislation and care of people suffering from mental health problems. Hosted by Exeter University, the site is based on a series of Wellcome Trust funded projects carried out since 2007 by Dr Nicole Baur and Prof Jo Melling (Centre for Medical History, University of Exeter), in collaboration with John Draisey from the Devon Heritage Centre (DHC). Another interesting article this week (discovered on Twitter from @KarenAbbott via @2nerdyhistgirls) was published in Collectors Weekly on the suitcases of patients the Willard Asylum. 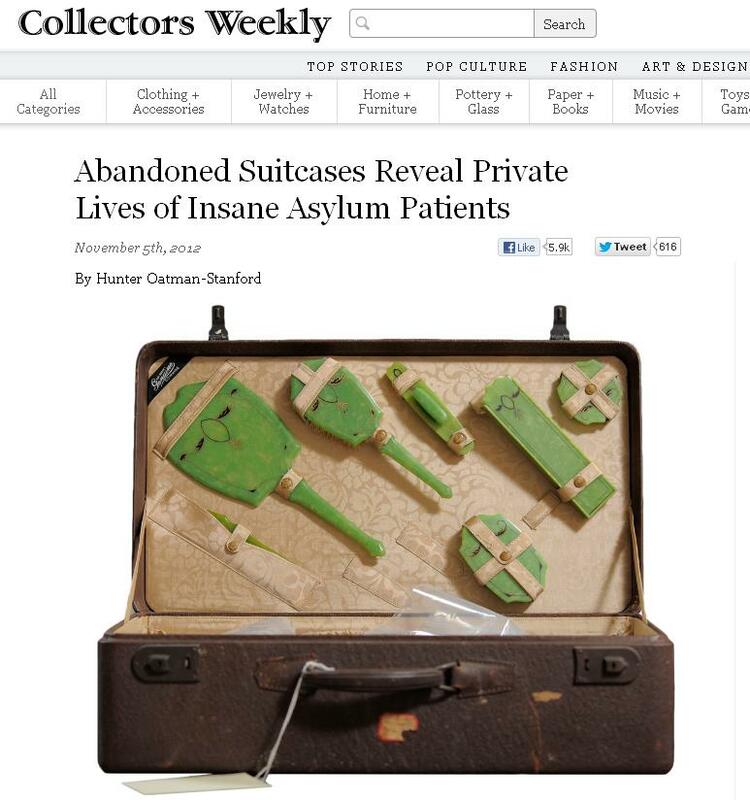 Hunter Oatman-Stanford’s article, entitled ‘Abandoned Suitcases Reveal Private Lives of Insane Asylum Patients examines Jon Crispin’s project to photograph the suitcases that patients at the Willard Asylum in New York State brought with them when entering the institution. The suitcases that were left in the institution, often when patients died and no one claimed their belongings, were kept by staff even after the asylum closed. The collection has been photographed by Crispin in added to the New York State Museum. This entry was posted in Electronic resources, News and tagged digital collections, history of psychiatry on 9 November 2012 by . Both the books are on reading lists for advanced papers in the MSc History of Science, Medicine and Technology at the University of Oxford. This entry was posted in Collections, News and tagged #newbooks, history of psychiatry, new books on 14 June 2012 by . Nick Tromans is a senior lecturer at Kingston University’s Faculty of Arts, Design and Architecture. He has published widely on many aspects of nineteenth-century art. 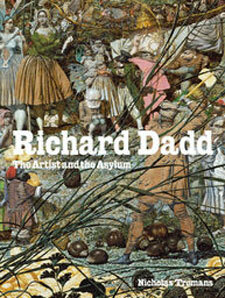 His most recent projects have been an exhibition exploring British Orientalist painting and a book on the Victorian asylum artist Richard Dadd. Coffee is available from 2.00pm – Seminars begin at 2.15pm prompt. All are welcome to join the speaker for lunch beforehand. Please contact Elise Smith (elise.smith@wuhmo.ox.ac.uk) for more details. 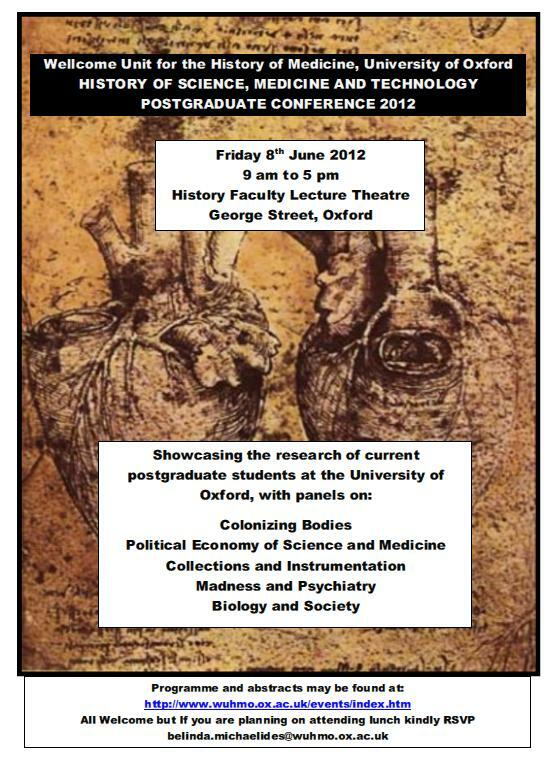 This entry was posted in News, Talks & events and tagged history of art, history of psychiatry, Wellcome Unit Seminars, WUHMO on 17 May 2012 by . A buffet lunch is included in the programme so please RSVP to belinda.michaelides@wuhmo.ox.ac.uk if you plan to attend. This entry was posted in News, Talks & events and tagged conference, history, history of medicine, history of psychiatry, history of science, US history, WUHMO on 16 May 2012 by . Drawing on the collections of NLM’s History of Medicine Division and including works from the United States, Latin America, the Caribbean and Canada, this initial release of Medicine in the Americas encompasses monographs dating from 1610 to 1865. Additional titles, dating up to 1920 and drawing further upon NLM’s comprehensive collection of early American printed books and journals, will be available on an ongoing basis in the future. The Bethlem Royal Hospital Archives and Museum was established in 1967 as the Archives Department of the Bethlem Royal Hospital and the Maudsley Hospital. It now houses art and historical collections spanning many centuries which are of unique interest and importance in the field of mental health. 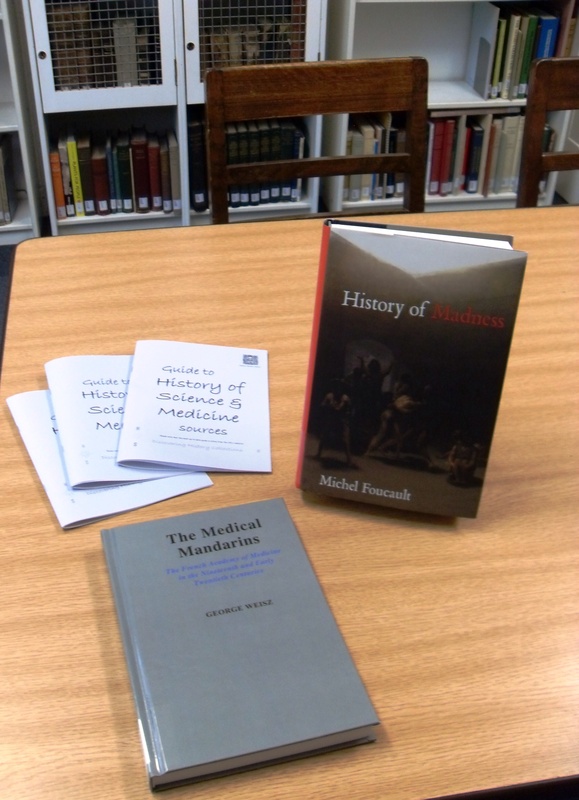 These include the archives of Bethlem Hospital (the original ‘Bedlam’, founded in 1247) and the Maudsley and Warlingham Park Hospitals; an outstanding collection of paintings and drawings, including works by Richard Dadd, Louis Wain, Jonathan Martin, and William Kurelek; the statues of ‘Raving and Melancholy Madness’ from the gates of 17th century Bethlem; and many other documents and artefacts of historic and artistic significance. The website is under continuous development. Its aim is to make the collections more accessible, and to provide accurate information to help in their interpretation. This entry was posted in Collections, Electronic resources and tagged archives, asylum, Bedlam, digital collections, history of psychiatry, museum, US history on 7 June 2011 by .